I'm still in my first year at my new-to-me-home, and the garden was nearly a blank slate when we moved in. So there's not been much blooming. But I was prowling around today and was surprised to find several things blooming. 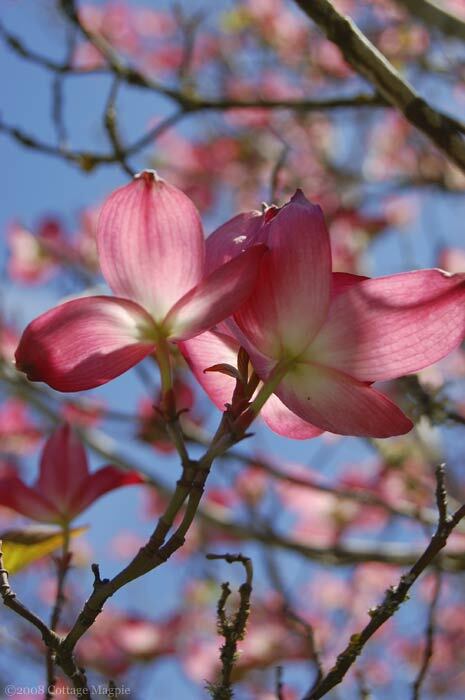 One of the things I was happiest to inherit in my new garden was a pink dogwood (Cornus florida var. 'Rubra'), shown here and above. Isn't it pretty? 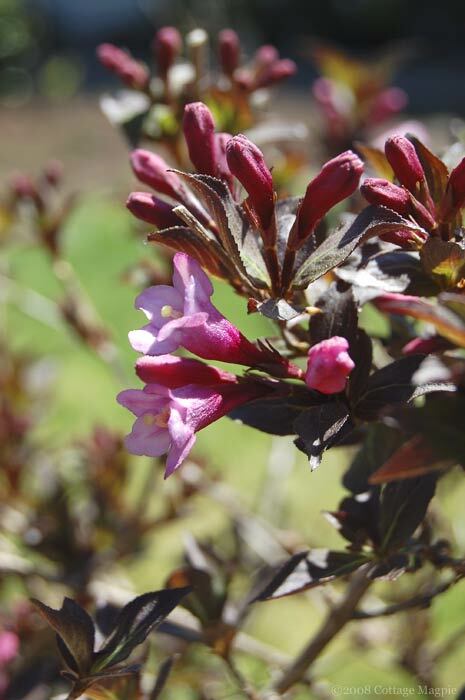 Another pink blooming thing we inherited is this mature "Wine & Roses" weigela (Weigela florida 'Alexandra') that was along the side of the house. I tend to be fickle with the weigelas--I see them in other people's gardens and love them but never make space for them in mine. But this one is staying, albeit in a new location, and even inspired the color of our front door. 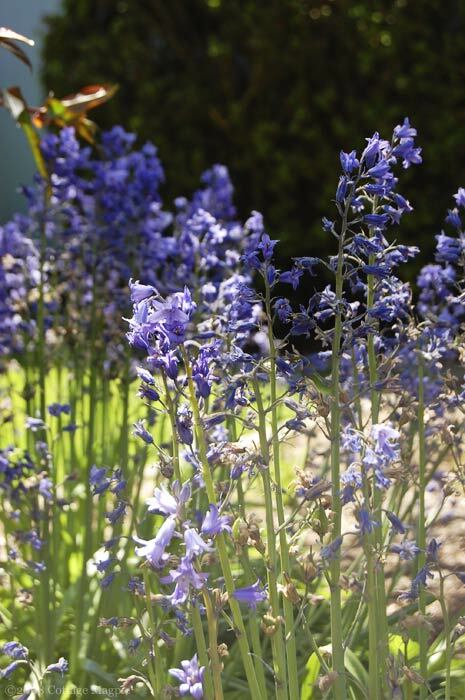 Another surprise in the new garden is a small patch of Spanish Bluebells (Hyacinthoides hispanica). They're getting a little tattered now, but they were a welcome bit of color as I have no other bulbs planted yet. 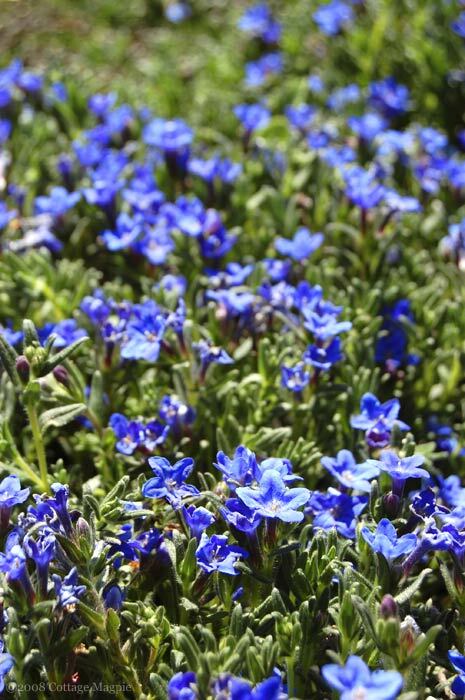 Yet another previous resident of my garden is a sizeable patch of Lithodora (Lithodora diffusa). I have to say, despite the bright blue flowers, I'm not a huge fan. Anyone want a bunch of it? Interestingly, one of the plants that I really wanted to bring from the other house but couldn't without leaving a gaping hole was a Japanese Snowball Bush (Viburnum opulus). As luck would have it, I have one at my new place, and it had several stem rootings going, so now I have a half-dozen. I know they only have this one show, but I just love them. I don't know which variety it is--we'll see if it produces berries or not. I did bring quite a few plants with me, including several large container plantings. 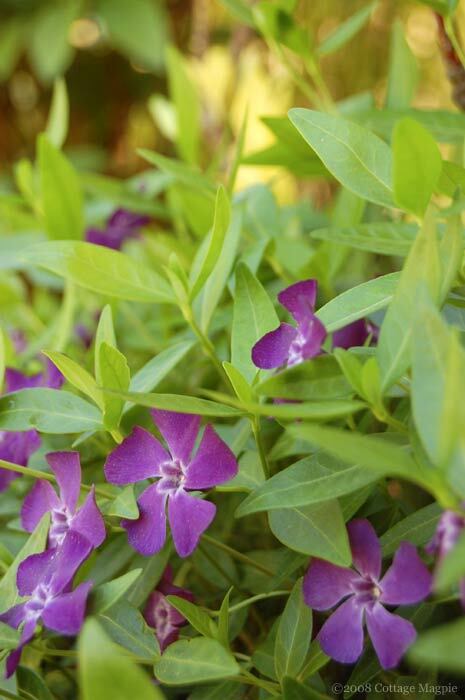 This one is overflowing with one of my favorite groundcovers, Lesser Periwinkle (Vinca minor). I don't care how common it is--I love it's draping habit, evergreen foliage and those pretty purple flowers every single Spring. 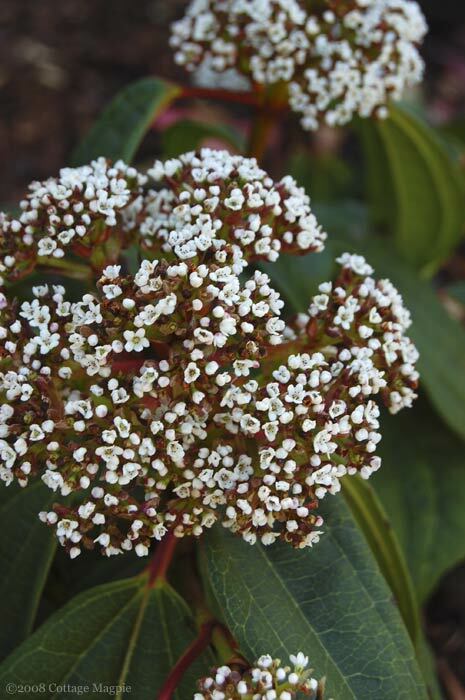 I've also installed some new plantings, particularly some foundation and "backbone" plantings in the front garden, like David Viburnum (Viburnum davidii), seen here in flower. This hardworking evergreen subshrub gets a bad rap for its extreme overuse in too-sunny parking lots and commercial landscapes, but in the right location it can add a wonderful backdrop and interest with it's large, distinctly patterned leaves. So that's what's blooming in my garden at the moment. Hopefully as the summer wears on and more plants find their way into permanent homes I'll have more to show. But for now, I applaud all these pedestrian plants for creating a lush backdrop for the flowers yet to come. How about you? What's blooming in your garden? This post is a part of the May 2008 Garden Bloggers Bloom Day, sponsored each month by May Dreams Gardens.